Steps one and two are to check out a detailed outline of our hiring process, as well as some tips and tricks for putting your best foot forward. Then visit our Summer Jobs page to learn more about our summer positions and locations. I’m having technical difficulties with my application. Help! Fear not. We’re just an email or a phone call away and happy to support. You can reach us at jobs@galileo-learning.com or 510.595.7293 ext. 2 during regular business hours, Pacific Time (cowabunga!). Include your resume and the job you’re hoping to apply to. We’ll get you on the right track! I already applied and have been hired to work at camp. What’s next? For what position or site should I apply? Our consideration process is designed to welcome as many exceptional people into our community as possible—apply for the position and general location that feel best, and we’ll work with you to find an ideal match. And because our process is focused on working together to find the right fit, there’s no need to complete more than one application. We’ll take all your qualifications into consideration, and keep our minds open to all the ways you might contribute to camp (in the role to which you applied, or in any other). I’m only available part-time, or can’t work all summer. Should I still apply? Nearly every role at camp is a full-time role (Monday-Friday, about 8 hours per day or 40 per week). Summer Intern positions are part-time, working about 5 hours per day, Monday through Friday. If you’re interested in working at just one camp, it’s helpful to be available for all camp dates at that site. Though our full summer season runs from early June through mid-August, some sites begin later or end earlier, so there’s probably a site that fits your summer schedule. In addition to hiring full-summer staff at individual sites, we hire a number of staff to fill shorter commitments as substitute staff members at multiple camp locations. If your schedule doesn’t fit one of our locations just right, and you’re flexible enough to work at more than one of our locations, we encourage you to apply for one of our Substitute Instructor or Substitute Camp Counselor positions. No matter your availability, we encourage you to apply! Just be sure to provide as much detail as possible about your schedule and location preferences within your application, and we’ll work with you to find the right fit. Is housing provided for summer camp staff? Galileo operates day camps, and housing is not provided for campers or staff. I applied! What happens next? Way to go! Next steps in our hiring process will be communicated via email. You’ll always hear from us regarding your candidacy, regardless of our decision. If you submitted an application and have not heard from us within five business days, check the spam folder of your email account, and then call us at 510.595.7293 x2 if you still don’t see an email from us. Please note: Our hiring team will contact you from an email address ending in @agents.icims.com, which may be filtered into your spam or junk email folders. We strongly recommend that you add the following address to your Contacts: *@agents.icims.com. See below for instructions on adding a new Contact in several common email providers. What are the steps of the summer staff hiring process? I’m not quite 16 years old. Can I apply to be a Summer Intern? It is our non-negotiable policy that all staff – including interns – must be 16 years old by the start of employment. Start of employment is the first day of camp (start dates vary by site). If you don’t quite make the cutoff, we hope you’ll apply in future seasons, post-sweet 16. If a job is listed on your website, is it still available? If you see a position listed, it’s most likely still available at one of our sites. Because we hire hundreds of staff on a rolling basis, we aren’t able to update listings each time a staff member is hired. We ask you to be as open as possible to other positions and locations if your first choice isn’t available. If you’re invited to the next stage of the hiring process, you’ll have an opportunity to discuss position and location availability in more detail. I am an international candidate interested in applying. Am I eligible to work at Galileo? We accept applications from all candidates who are eligible to work in the United States. International staff must have their own method of obtaining a visa that allows the holder to work for any employer (not only the visa-sponsoring employer). We don’t have a visa sponsorship program, but have provided a guide with general info on how to get the visa process started! Do staffers get a discount if they sign up their kids for a Galileo camp? Summer staff members are eligible to receive one free week of camp (including extended care) for one camper, plus 50% off additional weeks for all campers. This discount is only for staff members’ own children and does not apply to other family members. We accept applications all year. We begin interviewing as early as mid-spring for the following year, so recommend applying early. Positions fill on a rolling basis, and the earlier you apply the better your chances of finding a fit. Which locations are seeking Camp Directors? We generally have at least one opening in each of our regions each year (5-7 sites per region). You’ll have an opportunity to indicate your preferences on the application, and we discuss details throughout the interview process. Why don’t we open applications for specific sites? Our Camp Director team is made up of over 50 spectacular leaders, all with varying plans from one summer to the next. Some are with Galileo for the standard 3 year commitment; others have been with us for a decade. Between this varied degree of turnover, and new site openings, we often get down to the brass tacks of specific location preferences and assignments near the end of our annual hiring cycle. I’m a former Galileo camp staff member, and I’d like to be a Camp Director in the future, but I’m not sure about the upcoming season. Should I apply? The short answer is: Yes! We’d be delighted to see your application, even if you’re still on the fence. An early application lets us know you’re interested, gives you an opportunity to discuss the role in depth with the Galileo team, and allows your Area Director to support your growth into the CD role, this year or someday in the future. Apply away. We can’t wait to talk to you about your potential to take a seat in the director’s chair. Why do you require a three-summer commitment? Camp Directors are the driving force behind building and maintaining relationships with our camp communities. From campers and families to staff and school sites, the Camp Director is the glue that holds it all together. Consistency gives every camp a stronger foothold in its community, and allows each Camp Director to fully take advantage of the training and professional development integral the Camp Director role—growing into an even stronger manager, educator, leader and professional. It’s a win-win. Do Camp Directors get a discount if they sign up their kids for a Galileo camp? For enrolling their own children in camp, current Camp Directors receive 4 free weeks—including extended care—with more if space is available. Current Camp Directors may also gift 2 free weeks of camp to any child and recommend Financial Assistance approval for additional weeks with normal contribution amounts. Former Camp Directors who worked with Galileo for more than 3 years receive 50% off sessions and extended care for their own children. What do you do during the non-summer months? We get this one a lot, and we understand why. If Galileo runs summer camps, what do we do when camp isn’t operating? The short answer is: everything but deliver our programs. Or, everything that makes sure our programs are exceptional. With three programs in locations all over the Bay Area, Southern California and Chicagoland, operations need to be stellar, and we work year round on planning and improving them. We also develop all curricula in-house, and deliver new and improved projects, stories, and themes every single summer. And, we hire thousands of incredible staff members to make camp run (not to mention change lives). The process for bringing these folks on board is substantial. Our marketing team tells the world our story, and our Customer Service team enrolls thousands of weeks of camp. We have quite a big job cut out for us, and the fall and spring are crucial to our success. I really want to join your team, but don’t see any open positions. How can I find out when new positions open at Galileo HQ? Sign up for job alerts! Tell us your interests, and we’ll email you about newly-opened relevant positions. What do you most look for in an HQ candidate? We’re dedicated to fulfilling our mission while embodying our values daily. We value a vibrant and inclusive workplace, and love bringing divergent thinkers and viewpoints to the table at Galileo. We look for HQ candidates who believe in our mission, share our values, and want to be a part of a do-whatever-it-takes, playful team that practices what we strive to bring to our campers: real challenges, chances to fail, big wins, and F-U-N.
Start by getting familiar with our mission. Next, head over to our HQ Jobs page and review the brief descriptions of our open positions. Select any job title to see the full position description and access the online application. Before beginning your application, have a digital copy of your resume (Word, PDF, .txt files on your device, Dropbox or Google Drive) ready to submit. All positions currently open on our headquarters team and at our warehouse can be found on the HQ Jobs page of our website. We post year-round positions as they become available, and each fall begin the hiring process for seasonal roles (January – June/August) on our People Operations, Customer Service and Warehouse teams. Where is Galileo HQ located? Our headquarters office is in Oakland, and our warehouse is in Hayward. 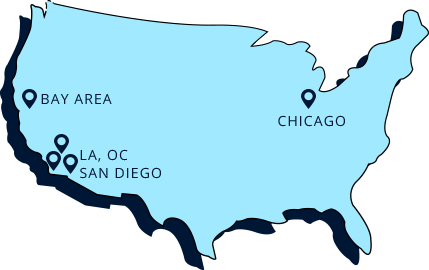 We also have two satellite HQ teams that work from offices in Southern California and Chicago. What are the steps of the headquarters hiring process? Below are the steps of Galileo’s hiring process for positions on our headquarters teams. Between each stage, the Galileo team decides on the appropriate next step and communicates with each candidate. Whether or not we decide to invite an applicant to the next stage, each applicant will hear about next steps by phone or email, often within 2-4 business days and no longer than one week. This process is ongoing until we find the right fit for our team, and can involve multiple in-person interviews with Galileo leadership team members depending upon the position. Do HQ employees get a discount if they sign up their kids for a Galileo camp? For enrolling their own children in camp, current year-round HQ employees receive 4 free weeks—including extended care (XC)—with more if space is available. Current year-round HQers may also gift 2 free weeks of camp to any child and recommend Financial Assistance approval for additional weeks with normal contribution amounts. As an alternate to the above, seasonal HQ employees may also gift 1 free session to any child and recommend FA approval for additional weeks with normal contribution amounts. Former HQ employees who worked with Galileo for more than 3 years receive 50% off sessions and extended care for their own children.